For purely historical reasons, James Connolly must be considered the most distinguished of all United States Olympians because, on 6 April 1896, he became the first winner at the Modern Olympic Games and the first known Olympic champion in over 1,500 years. In addition to his triple jump crown, Connolly won medals in the high jump and long jump. One can safely assume that this victory adequately compensated Connolly for the decision he had made at Boston some two months earlier. 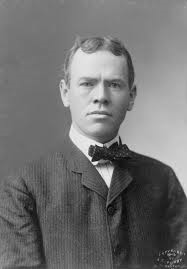 Connolly’s dean at Harvard had counselled him not to make the trip to Athens because his low academic standing might prejudice his being readmitted to the university upon his return. Connolly, however, entertained no doubts as to his priorities and walked out of Harvard, not setting foot there until 50 years later when, as a well-known writer of Gloucester fishing stories, he was invited to speak on literature before the Harvard Union. In 1898, Connolly was with the 9th Massachusetts Infantry at the Siege of Santiago, but in 1900 he again sought Olympic honors. He improved on his 1896 winning mark, but had to settle for second place behind Meyer Prinstein. Connolly missed the 1904 Olympics but competed in 1906, failing to make a valid jump in either the long or triple jump. Connolly later served in the Navy and in 1912 he ran for Congress as a Progressive, although he was defeated. Connolly covered Pershing’s “punitive expedition” into Mexico for Colliers and in 1917 he became European naval correspondent for the magazine. He remained a writer for the rest of his life. Personal Bests: HJ – 5-5 (1.65) (1896); LJ – 20-0½ (6.11) (1896); TJ – 45-10 (13.97) (1900).